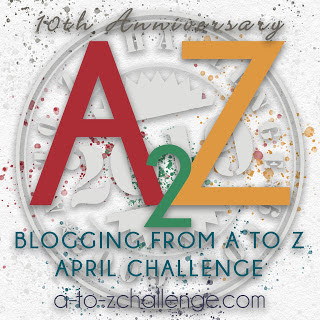 Today is the fourteenth day of the A to Z blogging challenge 2019. Till now I have brought you the stories of sportspersons from Hockey, Cricket, Football and several other fields of endeavour. But I have not yet written on any sportsperson from the sport Badminton which is indeed remiss of me as India has produced several stars in badminton. Keeping this in mind for the letter N, I have chosen none other than the youth icon of India, Saina Nehwal who has brought many accolades to the country. Saina Nehwal is the second daughter of Dr Harvir Singh Nehwal and Usha Rani Nehwal. She was born in Hisar, Haryana and has an elder sister named Chandranshu Nehwal. Saina's father has a PhD in agricultural science and worked at the Chaudhry Charan Singh Agricultural University at Hisar, Haryana. Saina finished her initial years of schooling at Campus School CCS Hau Hisar. Her father was transferred to Hyderabad and she finished her 12th grade from St. Ann's College for Women at Mehdipatnam. Saina's parents had played Badminton for a number of years. Her mother Usha Rani was a state level Badminton player in Haryana. When she was in Hyderabad, initially Saina found it difficult to socialize and she took up Badminton at the age of eight to express herself. Another reason for Saina taking up Badminton was to fulfil her mother's dream of becoming a national level Badminton player. Her sister Chandranshu played Volleyball. Saina's father had been a Badminton player in his university and he invested his provident fund to provide Badminton training for Saina. Saina's journey to glory started in the year 2006 when she became the under-19 national champion. She also won the prestigious Asian Satellite Badminton Tournament (India Chapter) twice thereby creating history. She became the first Indian woman and the youngest player from Asia to win a 4-star tournament - the Philippines Open. She was sixteen years old at that time. She was also the runner-up in the 2006 BWF World Junior Championships when she fought hard but lost against the top-seeded Chinese Wang Yihan. She was the first Indian woman to reach the quarter-finals of the Olympic games in 2008 when she upset world No 5 and 4th seed Wang Chen of Hong Kong. She lost to Maria Kristin Yuliant in a close finish in the quarterfinals. Nehwal was named "The Most Promising Player" in 2008 by the Badminton World Federation. In June 2009 she won the BWF Super Series title, thereby becoming the first Indian to do so. She beat the Chinese Wang Lin in the final 12-21, 21-18, 21-9. After the victory, Nehwal said, 'I had been longing to win a super series tournament since my quarterfinal appearance at the Olympics'. She reached the quarterfinals of the World Championship losing to second seed Wang Lin in the quarterfinals. In 2010 she reached the semi-finals of the All England Super Series before she lost to Tine Rasmussen. She then reached the semifinals of the Yonex Sunrise Badminton Asia Championships. At this point, her coach Gopichand told her not to allow pressure to build on her due to home crowd support. She won the 2010 India Open Grand Prix Gold. She beat Wong Mew Choo of Malaysia in the finals thereby winning a prize amount of $8,280. Saina won the second Super Series title of her career by defeating qualifier Tai Tsu-Ying of Chinese Taipei in the finals of the Singapore Open. She won prize money of $15,000 but this victory came in the absence of all the top 5 seeds and this took off the sheen from the victory a bit. On 24, June 2010 Nehwal reached a ranking of world No 3 in the women's singles Badminton world rankings. She defended the Indonesia Open title successfully. She again won the top prize of $18,750 for winning this BWF Super Series tournament. On 15 July 2010, Nehwal with 64791.26 points was placed at a career-high ranking of world No 2 only behind the Chinese Wang Yihan. On 27, January 2011 she crashed out of the Korea Open Super Series Premier in the second round. This was followed by further disappointment when she was defeated by Eriko Hirose of Japan at 2011 All England Super Series Premier. After two exits at an early stage, she then went on the beat Ji Hyun Sun of South Korea 21-13, 21-14 to win the Swiss Open Grand Prix Gold Badminton title on 20 March 2011. Following this, she lost to Cheng Shao-Chieh of Chinese Taipei in the second round of the Singapore Open Super Series. This was followed by another loss in the finals of the Indonesia Open Super Series Premier where she lost to her nemesis Wang Yihan of China. In the year 2012, she successfully defended her Swiss Open title. In 2012 she again won the Indonesia Open Super Series title by defeating world No 3 Li Xuerui of China 13-21, 22-20, 21-19. This was the third time she had won the Indonesia Open. On 4, August 2012, Saina Nehwal did India proud by winning the bronze medal at the London Olympics when China's Wang Xin had to retire from the match owing to injury. On 21 October 2012, she won the Denmark Open Super Series after defeating Juliane Schenk of Germany in the finals. There is a healthy rivalry between the other Indian badminton star PV Sindhu and Saina Nehwal. On 26 January 2014 Nehwal defeated PV Sindhu 21-14, 21-17 to win the India Open Grand Prix Gold tournament. Nehwal won the 2014 Australian Super Series by defeating Spain's Carolina Marin 21-18, 21-11. Nehwal became the first Indian woman to win the China Open Super Series Premier by beating Japan's Akane Yamaguchi. She defended her India Open title in 2015 by defeating Carolina Marin again. Nehwal won her first women's singles title at the India Open BWF Super Series by beating Ratchanok Intanon of Thailand. This resulted in her being the World number 1 when the BWF rankings were released on April 2. She became the first Indian women's player to be ranked World No. 1 in Badminton. In early 2016 Saina was troubled by injury problems but she eventually recovered. In 2016 she reached the semifinals of both the India Open and Malaysia Open. In the Badminton Asia Championships, she defeated Wang Shixian in the quarterfinals but had to settle for Bronze when she lost to Wang Yihan in the semifinals. She won the 2016 Australian Super Series when she defeated Sun Yu of China. On her way to the final, she had also defeated Wang Yihan. Saina made her third appearance in the Olympics but crashed out in the second round. In 2017 Newal was plagued by injury. However, she won the Bronze medal in the World Badminton Championship and a record-breaking seventh consecutive quarterfinal. In the 82nd National Badminton Championship, she once again beat PV Sindhu in the final. In the 2018 Asian Games, Nehwal created history by becoming the first Indian woman to win an Asian Badminton medal for India. She won a Bronze medal when she went down fighting to Tai Tzu Ying in the semifinal. She started 2019 by ending her run in the semifinals at the Malaysian masters in January. She won the first BWF Super 500 title, the Indonesian Masters. She went on the win the National Championship for the 4th time again by defeating top-seeded PV Sindhu 21-18, 21-15. Saina Nehwal has several accolades under her belt. Here is a list. For her Bronze medal in the 2012 London Olympics, she was awarded cash prizes by the state governments of Haryana, Rajasthan, Andhra Pradesh and the Badminton Association of India. She has been conferred with honorary doctorate degrees by the Mangalayatan University and the SRM Institute of Science and Technology. She is one of the athletes supported by the Olympic Gold Quest. She endorses several brands like Commune Builder, Edelweiss Group, Emami. Godrej No Marks, Iodex, Star Sports and Top Ramen Noodles. As regards her personal life, she is married to fellow badminton player, Parupalli Kashyap. Nehwal released her autobiography: "Playing To Win: My Life On And Off Court" in 2012. As of 2018 a biopic on Saina Nehwal titled Saina is being made. It is directed by Amol Gupte. The lead role was earlier slated to be played by Shraddha Kapoor but later Shraddha Kapoor was replaced by Parineeti Chopra. I hope you enjoyed reading about this outstanding sportswoman in today's post. Tomorrow I will come up with the story of yet another famous sports personality. My sister has met Saina Nehwal and she was so impressed by her. She said Saina is most approachable and down to earth celebrity. I personally love her as well. She has done India, and her game, proud many times over and I hope she continues doing so. Yes, I have heard she is a really down to earth and warm person. She has indeed done India proud. I enjoyed reading about this great sports woman. I browsed your blog, you are writing about such personalities. Great inspirational posts! Thanks for taking an interest in my blog Shristi. A truly inspirational personality who really is World class on the court. Love watching her games. Yes, indeed a very inspiring person and a world class player. Thanks for visiting. It is so inspiring to read such detailed information about people who have real talent and have touched our hearts because of their hard work. Enjoyed reading this story. Loved reading it. Saina has truly been a role model for an entire generation of budding badminton players. Yes, Her success set the ball rolling for a lot of other people to take up Badminton. Thanks for visiting. A couple of my friends met her at the Bangalore Airport. They were touched by her no fuss and down to earth personality. She's not just a great player, but also an equally good human being. Yes, I have heard that she is a great person from a number of people. And a great player of Badminton too. She's an inspiration . I wanted to be like her when I was young! Yes, many youngsters would like to emulate her. She is a role model. Thoroughly enjoyed reading on Saina Nehwal. I remember her winning game against Carolina M. It was a pleasure to watch it. Her father spent his PF on her badminton training. Applause and this should be a shinning example where in Indiaost of the parents save for the beti's wedding. Times are changing. Yes, instead of saving money for a daughter's marriage it is better to spend it on providing education or in any other way to help them achieve their dreams. A lesson for many Indian parents. A very inspiring perosnality for many and very much down to earth. One of the inspirational women athlete. The way she maintained her record for seven consecutive years is commendable. It Is always a treat to watch her playing. An inspiring girl and pride of the Nation. Yes, I agree fully. Thanks for visiting. Nice to read. You gave me a chance to know more about her. Thanks for visiting. I am happy you enjoyed the post. Many young girls look at her for inspiration and marvel at how far she's come with her hard work. It is a pleasure to watch her play. Her focus is amazing. Absolutely! And icon and an inspiration! Thanks for visiting. After Gopichand...one of the most important people who got Badminton back into the fray. Keep the good work going sirji. Thanks for visiting Manas. She is a student of Gopichand's Badminton academy. I used to adore her when I was in school. She is one of my favorite sportsperson. Thanks for visiting and commenting Shubra. Thanks for visiting Suhasini, Yes, I have heard from quite a few people that she is a really down to earth well-grounded person.